Pre-heat your oven to 200oC. Roast the garlic cloves, in their skins for 15 minutes. Meanwhile, in the bowl of your mixer, quickly stir together the flour, yeast, salt, water and olive oil. Lightly coat a large bowl with olive oil and add in the dough ball. Roll the ball around so it is lightly coated with olive oil. Cover the bowl with a shower cap* and allow the dough to rise in a warm place until it doubles in size. Mine took about an hour. 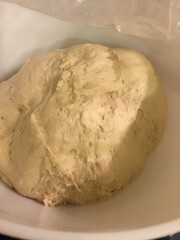 Lightly flour your work surface and add the risen dough. 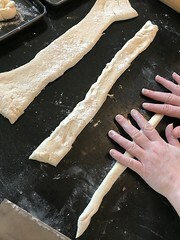 I used a rolling pin to roll the dough out to a large rectangle, about ½″ thick. Lightly flour a couple of baking sheets and set aside. Cut the dough into 12 strips. I divide it in half first, then half again, then thirds etc etc. Roll each strip into a rope, then tie each rope into a knot. Then tuck the ends back in underneath and over the knot, see pictures. 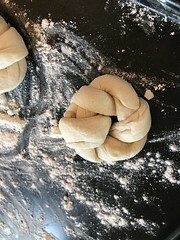 Place each knot onto the prepared baking sheet, about 1″ apart. Cover the knots with a light teatowel and allow to rise again in a warm place, until puffed and about double in size. This took about another hour for me. 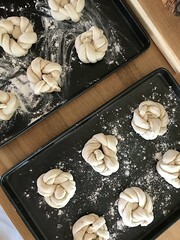 Bake the knots for 12-15 minutes or until slightly golden brown. Remove from the oven. While the knots are baking, add the butter, minced garlic, and parsley to a small saucepan and melt over medium heat. 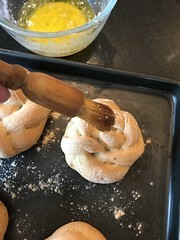 Once the knots are done baking, immediately brush them with the garlic butter. Let the butter sink in and then have at them. The very few that I had leftover warmed up very nicely the next day, too. Just divine.